Tamil Nadu allures with its art, literature, history, music and culture. The state of Tamil Nadu has the waves of Indian Ocean roaring on its South. 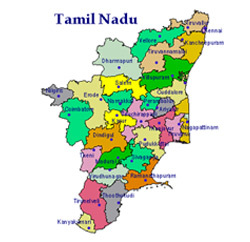 Literal meaning of Tamil Nadu is the Land of Tamils, and its history is documented to more than two thousand years ago. Temples of this state flaunt an unbeatable architectural style, along with legends that imbue the heart with faith. Tamil Nadu is often referred to as The Land of Temples; visit Madurai, Kancheepuram, Rameswaram and Kanyakumari (just to name a few), and see for yourself what lead to the christening. Cities like Chennai (capital), Coimbatore and Vellore are where you can find some of India’s topmost educational institutes, industries, shopping centers and unending entertainment. Ooty, Coonoor and several other cities of Tamil Nadu attract offbeat travelers and nature-lovers. For every traveler, Tamil Nadu has something on its platter and it is up to you which cities you consider best places to visit in Tamil Nadu, as per your preference.